Welcome to MG Yachts website! Please read these Terms carefully before using our website or requesting the provision of our Services. MG Yachts (henceforth referred to as “MG Yachts”, “we”, “our” or “us”) is a licensed Yacht Charter company with its head offices located at Alimos, Greece. MG Yachts provides yacht charters, a range of yacht management services, yacht sales and other services (“Services”, “Service”) in Greece. By booking a service or perform a transaction in any of these Services, you (henceforth referred to as “Client”, “you”, or “Clients”) shall have automatically accepted the terms mentioned herein, confirm that you have fully understood them and have agreed to all of them. Following booking arrangements with MG Yachts personnel, a Charter Party Agreement must be signed in order for the completion of the booking. Select the area, the type of yacht you like or just the size if you haven’t got a specific preference, along with the dates of your holidays and contact your local MG Yacht Agent or the main office of MG Yachts in Athens, Greece. It would be advisable if you are interested in chartering during the high tourist season to inquire about booking a yacht several months in advance. MG Yachts provides Charter event services such as parties, wedding events, corporate events and any other type of event is requested by the Client upon demand. Clients are responsible for providing accurate information during the booking process. Following booking arrangements with MG Yachts personnel, a Charter Party Agreement must be signed for the successful completion of the booking. According to the Greek Sailing laws you need at least one official sailing license in order to take over a Bare Boat. As a sailing license the Greek Port Authorities recognize any sailing license or certification from a sailing school, a yacht club or any relative organization is defined as the appropriate documentation officially recognized in the charterer's home country. ASA & RYA certifications are fully recognized. A sailing experience declaration may be required by the local port authorities for the skipper and co-skipper. MG Yachts reserves the right to decline a sailing license not recognized or accepted by the Greek Port Authorities. The co-Skipper can have similar certification to the skipper. MG Yachts reserves the right to oblige the charterers hiring a skipper if any doubt as to their sailing skills arises during embarkation. In bareboat charters at least one sailing license must be sent to us along with the booking confirmation. - The license must be in English language or translated and suitable for specific yacht. - Day skipper license is not accepted by Greek authorities. - The skipper is obliged to keep on board an updated authorized crew list at all times.In bareboat charters at least one sailing license must be sent to us along with the booking confirmation. If you do not have any qualifications and you need a skipper, MG Yachts can provide a professional skipper for as many days you wish. Also, a skipper can be hired even if you are an experienced sailor with sailing skills but you require your sailing holidays to be more relaxing and want to benefit from the skippers local knowledge. The skipper fee is always agreed beforehand and in writing and must be fully paid upon embarkation. Also, we remind you that the skipper needs his own cabin as he is obliged to sleep on board from the beginning to the end of the charter. There is a standard procedure that should be followed when taking over a bare boat. The check-in takes place at approximately 17.00 o’clock on the first day of charter. The check-out is arranged at about 09.00 o’clock in the morning on the last day of the charter period. Usually the charter starts and ends on a Saturday and lasts for 7 days, 14 days, or multiples. However, we can start on any other day upon request and can make any special arrangement in order to fit into your schedule if this is necessary. This means that we can arrange the location and the time of your check in and check out according to your wishes and your timetable if possible. The check in-out of our yachts will be done by an experienced person together with the skipper of your yacht. Keep in mind that you are responsible for returning the yacht at the pre-agreed place and time. Extra charges apply for the late return of the yacht pursuing to the Charter Party Agreement. MG Yachts acts as an intermediary for yacht owners willing to sell their yachts connecting them with potential buyers charging a service fee upon successful transfer of yacht’s ownership. MG Yachts acts a direct seller of the yachts owned by the company as those are displayed for sale through MG Yachts communication channels, brochures and promotional campaigns. MG Yachts provides to yacht owners yacht management services such as: maintenance, conservation, chartering, mechanical controls and technical support and other services upon demand. A. After reserving your required boat a Charter Party Agreement will be sent to you and the price that you will pay, as well as all other arrangements you have asked for will be officially stated on this contract, which is approved by the Hellenic Ministry of Merchant Marine. Upon signing this Charter Party Agreement, the amount of 50% of the charter fee is payable and the balance is paid either one month before embarkation or upon embarkation. Payments can be done by direct bank transfer, and by credit card (Master card or Visa) however no personal cheques are accepted. B. MG Yachts reserves the right to add, withdraw, substitute and/or vary advertised routes, prices and departure times for any of its Services displayed at the Website without notice. However, reasonable effort will be made to maintain arrangements as advertised. All prices include local taxes. A. According to the aforesaid Charter Party Agreement you have to leave a deposit that varies according to the size of the yacht. This insurance means that you are responsible only for that amount of money for any loss or damage that may be caused. B. To cover the security deposit, we accept credit cards (Visa, MasterCard) and cash. No personal cheques are accepted. C. There is also the alternative possibility for a Non-Refundable Security Deposit. This is a fixed amount depending on the size of the yacht and is a lot of less than the original security deposit. In this case the charterer is responsible up this new amount and no more. If the yacht returns without any damage, we refund the refundable part of the deposit to the charterer. MG Yachts reserves the right not to accept the non-refundable deposit. All our yachts are fully insured and are inspected every year by an International Registry of Shipping. In addition, they are covered for third party liability with a sum insured equal or higher than the minimum required by the Greek Legislation. Yacht’s insurance applies to the excess amounts over and above the security deposit chosen by the clients. Also, the company cooperates with top leading insurance companies such as Yacht Pool, Pantenius, Uniqua, EIS etc. who provide full insurance of the security deposit. (i) Bookings cancelled between 90 & 60 days prior to embarkation: 30% of the total charter fee is charged. (ii) Bookings cancelled between 60 & 30 days prior to embarkation: 50% of the total charter fee is charged. (iii) Bookings cancelled less than 30 days prior to embarkation: 100% of total charter fee is charged. If a cancelled yacht is rebooked under the same terms as the original booking, part or all the cancellation fee will be refunded. A. Client desires to participate in the Services offered by MG Yachts (the “Services”). B. Client is in good health and suffers from no minor or serious physical or mental injury, illness or disability that would make Client especially susceptible to injury or disability while performing any activities related to or in connection with the Services. C. Client fully comprehends and accepts all of the risks associated with his/her participation in the Services including, without limitation, exposure to unfavorable weather conditions, food sickness, allergic reactions, choking, injuries (e.g. without limitation, those arising out of self-inflicted accidents or mishaps) and death. D. Client agrees indemnify and hold MG Yachts harmless from and against any criminal act or conduct and any illegal use of the yacht during the chartering. Our Privacy Statement, which is hereby incorporated into these Terms, governs your use of the website and our Services. Your acceptance of these Terms is also your consent to the information practices set forth in our Privacy Statement. MG Yachts respects the personal data of every visitor of the website https://www.mgyachts.gr and procures for a safe and complied to all applicable data protection laws navigation. Please review this Statement for Privacy and Protection of Personal Data ("Statement") to learn more about the information we may collect about you through this website and how we collect, store, use, share and protect the information/personal data that we obtain. MG Yachts maintains the personal data that you have provided by filling in the respective fields in the electronic booking form or via email communication with MG Yachts personnel to be used within the context of facilitating your booking or of various promotional campaigns, offers and/or newsletters that it may circulate from time to time. Name, Email, Mobile number, Passport, Date of Birth, Gender, Nationality, VAT number and Address. MG Yachts obtain only personal data that are voluntarily provided by you in order to satisfy your requests and charter plans, to provide information for products and services and to serve you in the best way. Whenever additional information is requested you will be notified accordingly. The collection of personal data takes place only if you select voluntarily to provide them – for example, if you communicate through email or if you book one of the services of MG Yachts. The use of services provided by https://www.mgyachts.gr , including the provision of charter arrangements, offers and relevant bookings requires ensuring the communication possibility with you. Therefore, during your booking form submission to the website https://www.mgyachts.gr , it is necessary to declare the true personal data that you will requested for, as they are determined above. Where practical, we will collect personal information directly from you. Generally, this collection will occur when you deal with us either in person, by telephone, letter, facsimile, email or when you visit our website. Following your explicit consent, we may collect personal information about you when you purchase or make enquires about charter arrangements or other products and services, when you enter competitions, when you register for promotions, when you subscribe to receive marketing from us (e.g. e-newsletters) or when you request brochures or other information from us. We may also collect your personal information when you complete surveys or provide us with feedback. With the filling and submission of the booking form to the services provided by https://www.mgyachts.gr, you also consent to the storing and use of your personal data, according to this Declaration. We are allowed to process your personal data, in order to provide personalized services, according to the law (article 6(1b) of the Regulation (EU) 2016/679). Your personal data are not used for other purposes, apart from what it is described in this Declaration, except if we receive your prior permission, or except if something like that is required or is allowed by the law. The purpose of the collection, use and processing of your personal data, is (a) to provide the services you request through the website or direct communication with our personnel, for the receipt of which their use or / and process is required, e.g. 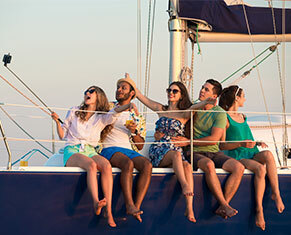 online bookings of charter arrangements and the consequent implementation of the contractual obligations, in order to execute, deliver and invoice of orders under the best conditions and with the most effective way, (b) the promotion of the services provided from MG Yachts and especially through https://www.mgyachts.gr, (c) the provision of personalized services and the facilitation of the service execution process, aiming to the facilitation of the client and / or ensuring that the content of the website is presented to the most effective way for you and your devices. MG Yachts collects “sensitive” personal data only when you offer voluntarily those data or when these data are required or their collection is allowed by the law. We advise you to abstain from providing sensitive data, except if this is required for the purpose of providing personal data or if you hereby consent with the use of these data from MG Yachts for its purposes. MG Yachts may ask you to provide it particular personal data to send you informative messages related to services or / and related offers and announcements. MG Yachts may also request your permission for particular use of your personal data and you may either consent or deny these uses. If you want particular services or communications, such as an electronic newsletter, you will be able to unsubscribe from the relevant recipients list at any time following the guidelines included to each communication. If you decide to unsubscribe from a service or communication, we shall try to delete your data as soon as possible, although we may need some time or / and information before we will be able to process your request. If you wish, you may request at any time to get informed about your personal data that are maintained by MG Yachts, their recipients, the purpose of their maintenance and processing, as well as their modification, correction or deletion, by sending an email to the address from the email address you have declared. You also have the right to review your personal data we maintain and, in general, to exercise any right foreseen by the law for the protection of the personal data. The personal data you disclose to MG Yachts through https://www.mgyachts.gr , either during your booking form submission or at a later stage, are collected, used and processed in accordance with the applicable personal data protection provisions. In particular, according to the provisions of the Law 2472/1997 and the Law 3471/2006, as in force, as well as the new European General Data Protection Regulation (EU) 2016/679 and the Directive 95/46/EC, related to the protection of personal data. MG Yachts does not share or transmit personal data to third parties, unless this is required for legitimate professional purposes and business needs, in order to meet your requests or / and if this is required or permitted by law. In any case, the access to your personal data is allowed only to authorized persons that are required to have access in order to be able to complete the purposes of the collection, the use and the processing of them, as this disclosed in this Statement. In some cases, MG Yachts may share your personal data with various companies or service providers who collaborate with it, in order to respond to your requests, or to natural or legal persons that are assigned with the process implementation, provided that we will notify you in advance and we will receive your prior consent. People who have access to the data are obliged to maintain the confidentiality of the data. MG Yachts may store your personal data in a cloud. This means that the process of your personal data may be conducted by a cloud service provider on behalf of MG Yachts, and your personal data may be stored in different locations around the world. The Company uses organizational and contractual measures for the protection of the personal data and to impose similar, yet less restrictive, requirements to our cloud service providers, including requirements regarding the exclusive processing of your personal data, for the aforementioned purposes mentioned in this Statement. MG Yachts applies particular procedures for technical and organizational security, in order to protect personal data and information from loss, misuse, alteration or destruction. Our partners who support us in the operation of this website also comply with these provisions. MG Yachts makes every reasonable effort to maintain the personal data collected only for the period of time it needs these data for the purpose they are collected or until their removal is requested (if this occurs earlier), unless it continues to maintain them according to provisions of the applicable legislation. Information storage is within our secured physical premises with various degrees of security control for access to computer records. We keep hard copy files within locked security rooms at all times. MG Yachts uses the technology and software of third parties in order to operate its mailing service and its booking process. All our Partners are fully complied with General Data Protection EU Regulation and policies. MG Yachts reserves the right to modify or periodically revise this Statement, in its sole discretion. If changes occur, MG Yachts will record the date of modification or revision in this Statement and the updated Statement will apply for you from that date on. We encourage you to periodically review this Statement to explore whether there are any changes to the way we manage your personal data. This Statement was last updated on May 25, 2018. MG Yachts shall retain all worldwide rights in the intellectual property of the website and any content on the website, including, but not limited to, the artwork, “look and feel” of the website, its color combinations, layout, and all other graphical elements, photographs, videos, sounds, visual interfaces, design, logos, trademarks, services marks, content, compilation, source code or HTML code, products, software, and other material contained or presented on the website, and any combination thereof (“Material”, or “materials”). The Material is copyrighted or otherwise protected and owned by MG Yachts, or a third party who licensed the right to use to MG Yachts, and as such is protected by Greek and foreign copyright, trademarks, trade secrets, patents, and other intellectual property laws and other applicable laws worldwide. Except where your use constitutes “fair use” under copyright law, you may not otherwise use, download, upload, copy, print, display, perform for commercial use, modify, reproduce, publish, republish, license, post, transmit or distribute any Material on the Website in whole or in part without the prior written consent of MG Yachts. MG Yachts, its affiliates, business partners and/or licensors own all right, title and interest, including all copyright, trademark, trade secrets, patent, and other intellectual property rights in such Material. - All information supplied by you on this website is true, accurate, current and complete. This license shall automatically terminate if you violate any of these restrictions and may be terminated by MG Yachts at any time. MG Yachts may revise these terms and conditions at any time without notice. Revised terms and conditions will apply to the use of this website from the date of the publication of the revised terms and conditions on this website. By using this website you are agreeing to be bound by the then current version of these Terms and Conditions of Use. Please check this page frequently to stay aware of any changes. Any claim relating to MG Yachts website shall be governed by the laws of the Hellenic Republic without regard to its conflict of law provisions.